Audi A7 Performance, Engine, Ride, Handling | What Car? 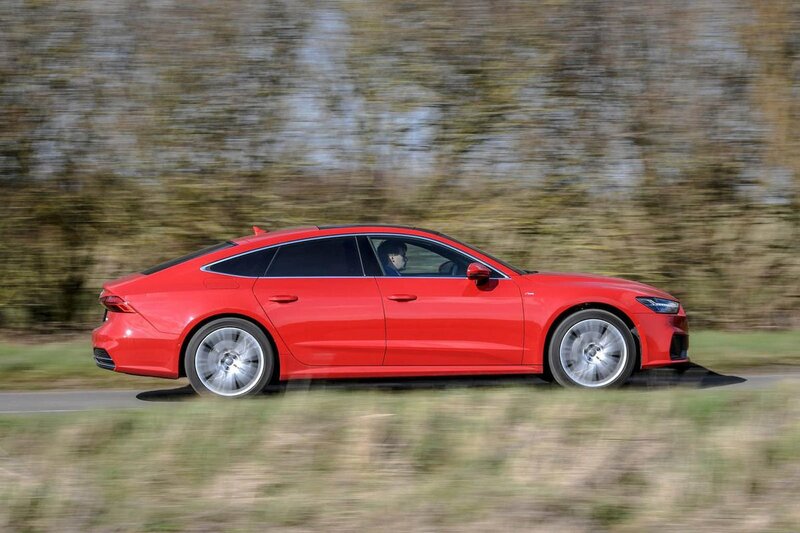 For diesel lovers – if there are any of you left these days – the A7 Sportback comes with a very admirable 282bhp 3.0-litre V6 diesel that's badged, rather esoterically, 50 TDI (no, we're not sure what that means, either). But it is typically grunty from low revs and has plenty enough left in the mid-range to sail you onto motorway speeds without breaking a sweat. In fact, it'll all but match anything a BMW 630d will do in terms of acceleration, although the more powerful and only slightly pricier Mercedes-Benz CLS 400d is significantly faster. For some reason, compared with other Audi cars that use this engine, you get a touch more vibration filtering into the interior of the A7 than we're used to; it's still very refined overall, mind. That said, as well as being quicker, the CLS 400d proves itself smoother, too. Meanwhile, the 55 TFSI petrol is as smooth as you could wish for and quicker than the 50 TDI, but you have to rev it harder to maximise its performance. Doing so will put an even bigger gap in the fuel economy advantage the diesel provides, of course. Our only significant complaint with both engines concerns the eight-speed automatic gearbox they come with; it can be painfully slow to kick down and, if you go to overtake, for example, it faffs around for a second or so before finally giving you the beans in a rather erratic fashion. It's genuinely irksome and, sadly, even selecting Sport mode does little to improve things. Manual mode is more obedient, thankfully. 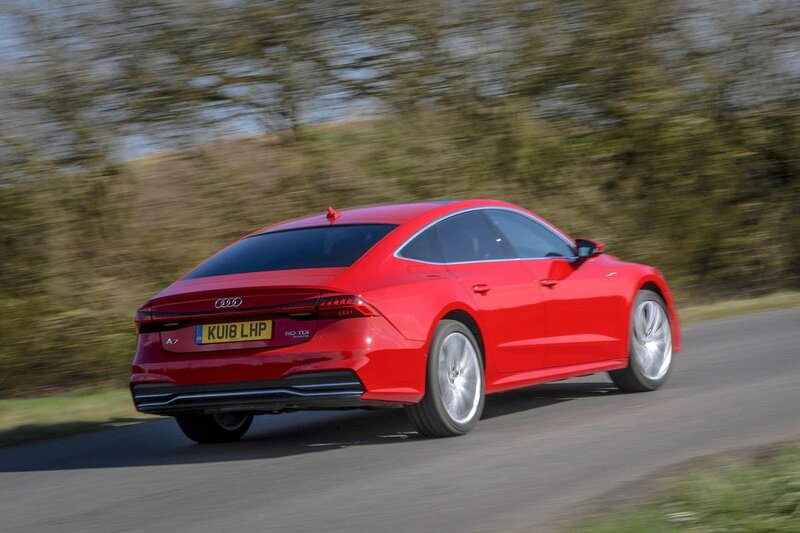 The A7’s new mild hybrid technology works well on both engines, allowing seamless coasting for extended periods between 34mph and 99mph when you come off the accelerator. Energy is stored in a battery pack when braking and this process has no effect on brake pedal feel, unlike in some full hybrids. Audi’s intelligent start-stop system kills the A7’s engine from 13mph while rolling up to traffic and can start it again if, via its front-mounted camera, the system detects that the car in front has started moving away. It sounds complicated but it works well enough, although this function is no smoother than that in most of its rivals. Whichever engine you buy, the A7 is no sports car. That’s not to say it can’t be hustled quickly down a winding road – quite the opposite, actually. The combination of standard quattro four-wheel drive and precise steering mean it’ll hang on for surprisingly long before it starts to struggle. It’s without doubt a tidier thing than the wallowy 6 Series Gran Turismo. It doesn’t feel that much fun, though – merely effective. 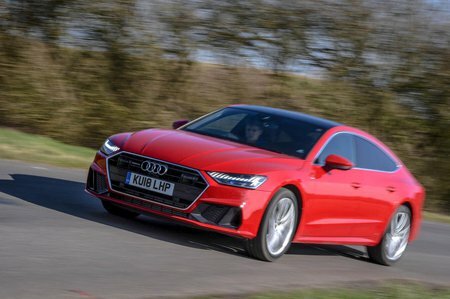 There’s precious little information filtering up from the front tyres to the steering wheel, and while the optional air suspension does limit body roll in Dynamic mode, it can’t hide the A7’s near-two-tonne bulk through quick direction changes. What the car does do well is grip the road firmly and in a totally predictable manner. One of the options you might be considering is four-wheel steering. It certainly helps low-speed manoeuvrability in tight spots, but it gives the steering an inconsistent feel at other times. Factor in how much it costs and we'd suggest it’s best to leave that box unticked. We would select the optional air suspension, though. While the fixed sports suspension is well controlled but pretty firm, the air springs treat you to a wafty high-speed ride with a pleasant floatiness across undulating roads, making it one of the most relaxed cars in its class at speed. However, there’s a trade-off; when you slow things down on a poorly surfaced town road, an A7 with air suspension thuds more heavily than one with fixed sports suspension – or a 6 Series, for that matter. We have yet to try the standard steel springs or optional steel springs with adaptive dampers, though. Hopefully, one of these could offer the best blend of comfort and handling. At speed, there's a bit of road noise but precious little wind noise to spoil the peace, bolstering the A7’s claim to be a genuinely top-notch long-distance cruiser.